According to the American Optometric Association, one out of four children in the U.S. has an undiagnosed vision problem signaling a vision care crisis that is affecting students’ ability to see and learn. In fact, the Centers for Disease Control has identified vision disorders as the single most prevalent disabling condition among children in the United States. 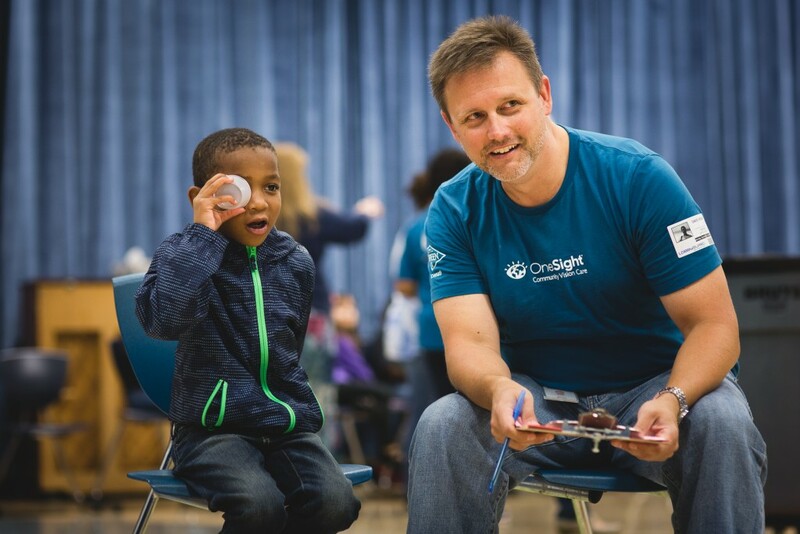 Local employees of Luxottica Retail’s North American headquarters in Mason are responding to this need by volunteering their time and expertise to conduct vision screenings for 30,000 students in 100+ Cincinnati schools now through mid-October in partnership with OneSight. OneSight is a nonprofit organization committed to providing sustainable access to quality vision care and eyewear in underserved communities worldwide. Luxottica employees volunteer to help staff OneSight’s charitable and sustainable vision care programs in Cincinnati and around the world. Teams of trained Luxottica volunteers will perform required vision screenings for all Cincinnati Public Schools students now through October 16. “OneSight programs provide an opportunity for our employees to use their skills and energy to give back locally and globally,” said Judy Fimiani, Luxottica VP of Talent Acquisition. “In fact, having the chance to help change the world ‘on the clock’ is one of the elements of working at Luxottica that employees love most.” Luxottica employees have helped over 350,000 Tristate students through OneSight’s Community Vision Care program since the program began in 1988. As a result of the screenings, all students identified as having a vision problem and financial need will be referred to the OneSight Vision Center at Oyler School for a free comprehensive eye exam and glasses. Launched October 2012, the OneSight Vision Center at Oyler School is the first self-sustaining school-based vision center in the U.S. The center provides comprehensive eye exams, glasses, fittings and adjustments, medical eye care and vision therapy with an on-site Doctor of Optometry, ophthalmic technician, optician and office manager. Since opening in 2012, the center administered 7,070 eye exams and 4,731 students received glasses, a 67% need rate. Based on the success of the Vision Center at Oyler, OneSight is current in the process of expanding the school-based model in Butler County and other cities nationwide.